The Harry Potter series is one of the most successful and respected fantasy epics of our time. J.K. Rowling captivated both readers and audiences with her story of a young boy who discovers the existence of magic and ultimately must fight to save it. Despite an understandably mixed reaction from book purists, I believe the films are entertaining on their own merits. They aren’t all perfect, but the good far outweighs the bad. The series hit a road bump with 2016’s Fantastic Beasts And Where to Find Them, based upon the in-universe book of the same name, but with an entirely new story written for the screen by Rowling herself. I watched it in preparation for this film, Fantastic Beasts: The Crimes of Grindelwald, and found it a passable yet underwhelming installment that would likely entertain youngsters. However, the Potter series improved over time, so I hoped it might be a similar case here. Therefore, it is with a heavy heart that I report Fantastic Beasts: The Crimes of Grindelwald a thudding disappointment. Most adult fans will likely gawk at this installments’ outrageous rewriting of lore and needlessly convoluted story line, though young kids may enjoy the creatures when they appear. Despite a brilliant cliffhanger, Fantastic Beasts: The Crimes of Grindelwald is a long, tedious, and pointless cash grab that further dampens the franchise. 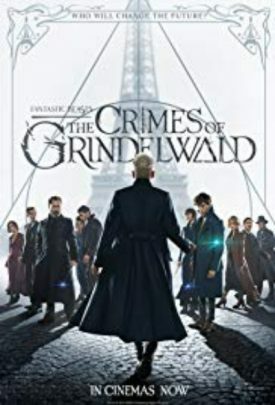 Newt Scamander (An admirably dedicated Eddie Redmayne) is asked by Albus Dumbledore (An underused Jude Law) to capture escaped convict Grindelwald (A surprisingly enjoyable Johnny Depp), and only agrees so he can locate his love interest, the Auror Tina (Katherine Waterson). Newt takes Muggle friend and comedic relief character Jacob (An annoying Dan Fogler) for the ride, who is having forced relationship drama with Tina’s magic sister Queenie (Allison Sudol). However, all must come together in order to stop Grindelwald and save the wizarding world. I’d mention the other characters and subplots here, but their presence in this story is either unnecessary or would be a spoiler. This is the worst film of the series. The story is needlessly complicated, the script and direction are reminiscent of a soap opera, and some of the actors read their lines as though seeing them for the first time. The beasts are barely present and are still less convincing than the creatures from 10 years ago. The lead characters remain frustratingly boring (with one exception), being rushed from one action scene to the next and talking about romance problems rather than receiving development so we might care about them. I’ve spent 4 and a half hours with these people, but they all have less depth than Harry and Co. did at the halfway mark of Chamber of Secrets, before the story even got juicy. Lastly, J.K. Rowling’s continued insistence on thinly-veiled political commentary will turn off a portion of her audience and fly over the heads of the children who just came to see magic and creatures. On a positive note, Depp, Redmayne, and Sudol make most of this mess bearable, and the ending twists are potentially brilliant if utilized properly in films 3-5. The tone is more consistent and the film has fleeting moments of charm. However, the overall product is too mediocre to warrant seeing in the theater. I sincerely hope J.K. Rowling can realize the potential of her story at this point and use it in the fullest. If Fantastic Beasts 3 is anywhere as bad as this, I will give up on this prequel series and mentally decannonize them. Fantastic Beasts: The Crimes of Grindelwald is a slow, poorly-executed mess with uninteresting heroes, mediocre effects, and the intrigue of a bland soap opera. Despite some devoted performances and two devilish twists, this film’s biggest Crime is turning a once brilliant franchise into yet another generic and forgettable blockbuster. Should the follow-up be this bad, I’ll gladly Obliviate these entries from my memory.